How to Recover Lost Joomla Admin Password? Joomla websites do not have a feature as in where you can retrieve a lost password. If you a Joomla user and have lost your password you may be at a loss as to how to retrieve it. Many websites have the feature or a link called “Forgotten password” which helps the users regain their lost passwords. But that is not the case with Joomla; you would have noticed your Joomla website admin section does not have ‘Forgotten Password’ link. The reason behind this is quite simple in fact. Joomla is one of the websites were the password is stored using a one way salted MD5 hash method. This way of storing the passwords is really fool proof and thus prevents users from the ability to recover the password when required. Although you need not be alarmed by this fact. There is an alternative available and you will not be locked out of your Joomla Websites admin section forever. To start with login to the control panel of your website server hosting. Once logged in to your account navigate to the database section of your hosting account. Search for a database administrator of some kind. The most common database administrator used is phpMyAdmin. If you find that it is fine or else your server may be using a different one hence you many have to look a bit harder for it. Once you do find the phpMyAdmin for your domain; depending on the security level of your hosting you may or may not be prompted to login to your database by providing the user name and password for the database. In most cases you will have direct access to your database but in the remote case where you do need to enter your credentials in order to access the database; you will first need to retrieve them from your web server. In this case you will need to look for a file manager in the control panel. (Alternatively you could connect to your website via FTP as well). Once you are connected to your web server files you need to go to the root directory of your website and search for the file by the name configuration.php. Once you find the file edit or open using some editor. Search for the variables by the name ‘user’ and ‘password’. 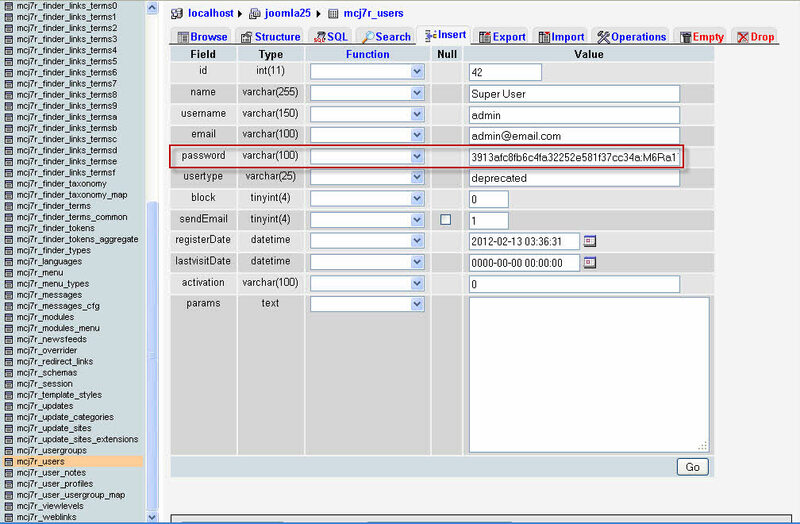 Note these down since you will need to use these values to get access to the database via phpMyAdmin. Now go back to the database section and try to access your database via phpMyAdmin. Use the user name and password we noted down if prompted for and enter the database. Once in look for a table by the name users. This table is likely to have a prefix of some kind. The prefix can be ‘jos_’ but not necessarily so. It can be something random as well. Once you do select this table you will see a list of users that you can edit. If you are the administrator which I assume you are you can edit the user by the name ‘admin’. Enter a new password in the ‘Password Field’ and before moving away select the option ‘MD5’ in the function drop-down section for the password field. Save it and return to the admin section of your Joomla website and login using the user name and the new password. Once you do get in it would be a good idea to make a note of the password and store it in a safe place. This is not a hard procedure to follow if you do have some experience dealing with software or computers in general. But for those with little experience working with computers it is likely to be slightly difficult. In that case you may need to take expert advice and help from a professional Joomla Web developer. Alakmalak is one such company that offers Joomla Web Development services and can help you out in your tasks big or small.